Walking is one of the easiest actions you can take to improve your health. 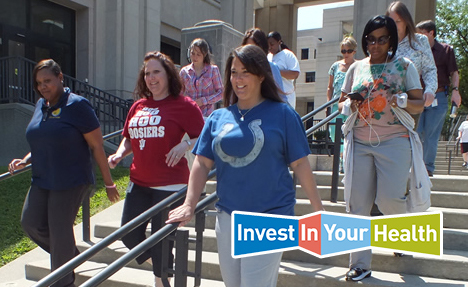 The Indiana State Personnel Department (INSPD) and Invest In Your Health Indiana is reviving the walking club for the Indiana Government Center Campus to increase fitness and mobility at work. If you are interested in participating please click below to register. Join the group on Mondays, Wednesdays and Fridays at noon each week for 30 minutes of physical activity. The group will meet in the atrium of Indiana Government Center South near the north doors. It is recommended that you wear comfortable shoes. If you have any questions you may contact us at spdcommunications@spd.in.gov. Participation in this walking group is totally voluntary and occurs during non-paid time. Wellness walking activities are not a condition of employment and are not covered by Workers’ Compensation. Fellow participants/leaders are not health care professionals and are not responsible for your safety. Participate at your own risk. Within each group, there are participants that walk at a variety of speeds. Finding someone to walk with at a pace that is comfortable for you, should be no problem on most days. Regardless of which group you begin with, you are welcome to speed up or slow down as you wish. From Beginner to Advanced, and everywhere in between, we have a pace for you. Don’t let weather conditions stop you from meeting your daily steps goals. Nine tunnel tour maps are listed below, with varying routes and step distances, all completely indoors using the tunnels connected to the Indiana Government Center. 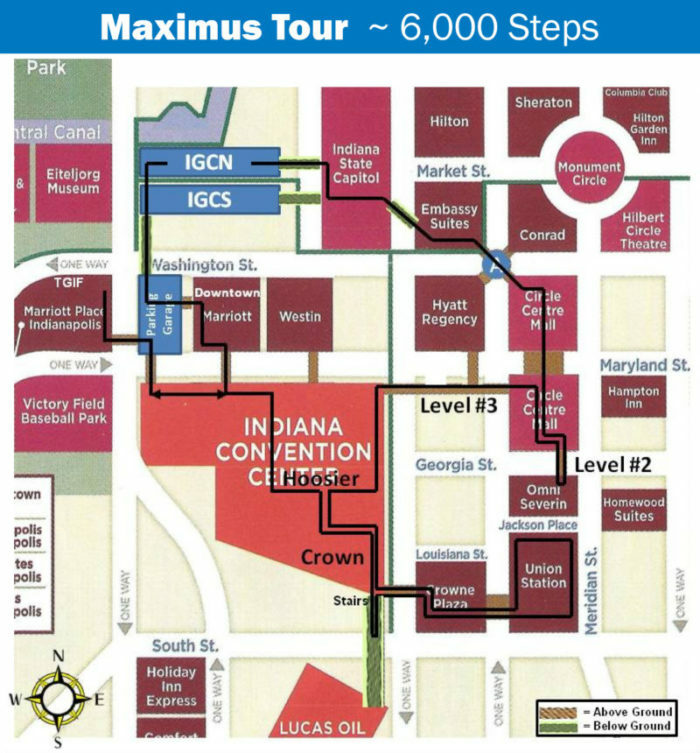 The routes range from approximately 800 to 6,000 steps and can last up to an hour. It takes approximately 10 minutes to walk 1,000 steps. Steps and time may vary.